Appearance: Reddish-orange color. Slightly cloudy with lots of floating sediment. Fluffy one-inch head that dissipates very slowly. A good amount of lacing that clings to the glass as you drink it down. Aroma: Tangerine. Lemon zest. Strong hop/pine scent. Some mild malt sweetness coming through in the background. Taste: Medium carbonation. Creamy mouthfeel. Mild sweetness upfront which fades quickly. The strong hop flavors start in the middle and work their way towards a tingly, long lasting bitter finish. 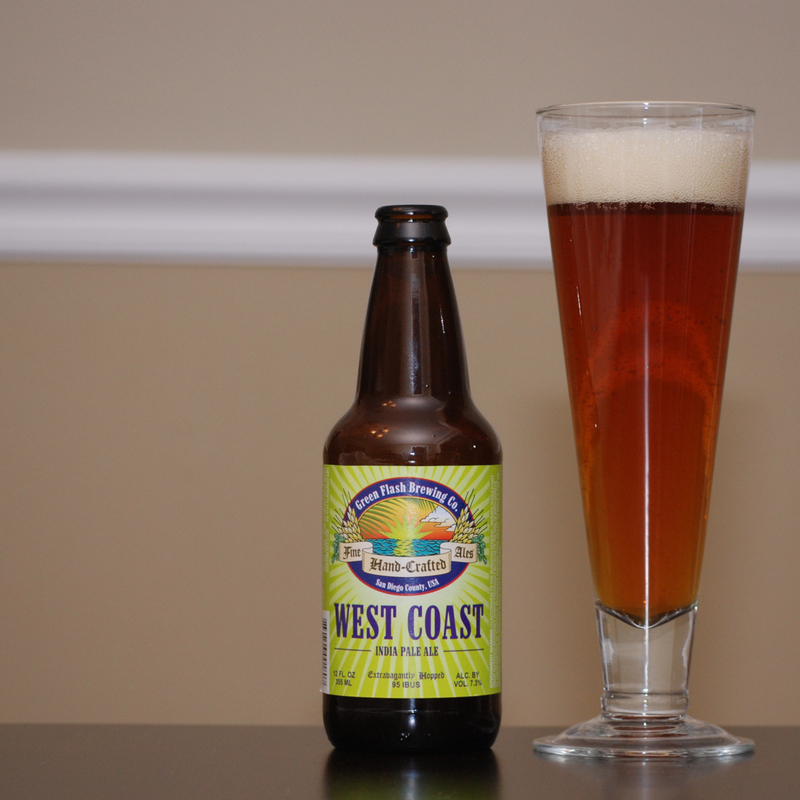 If you like strong, hop-infused beer, then the Green Flash West Coast IPA is for you. Though it has a relatively high ABV, I found this beer to be very drinkable. I particularly enjoy how the hop flavors intensify from mid-palate to the bitter end. If you hate hops, skip it. But if you love them, buy this beer. You won’t be disappointed. Love this brew and it is dangerously drinkable! Definitely not a beer for all moods, but I could imagine downing this with some wings during a game. What did you pair it with? Had it on its own this time around, but I can definitely see having this with some wings or BBQ. Huge fan of this beer. Great review, can’t wait to get my hands on another sixer. It’s tasty stuff for sure! I realize I’m probably opening the door for a Wookieslam, but is this too hoptastic for my palate. Not sure. I really like it, but you know how weird my tastes can be at times. Can you say Fernet? Maybe Green Flash will consider making a Raspberry Mango Pale Ale for you, sweetheart! You might be onto something Wookie! I mean, Apri’hops is pretty tasty. Why not Mango’hops? OK, as you might imagine, I’ve felt compelled to post a reply given my affinity for all things West Coast (well, except for most of the malarky on Discovery HD’s West Coast Customs because they do freakish things with tools and loud machines). As a former SoCal resident and frequent San Diego visitor, I bring unique capabilities to bear in responding to a review of a West Coast brew. Green Flash has always been one of my favorite breweries and the fact that it shares the neighborhood with Stone, Ballast Point, Mission, AleSmith, Port and Coronado is just a bonus. With competition like that down the street you had better be capable of turning out West Coast Hop Bombs or you’re dead in the Burtonized water. Their West Coast IPA lives up to the name. A classic and well-crafted “West Coast” IPA. Always welcome in my beer fridge and thanks to a ramp up in production, its somewhat more available on the Least Coast than it was several months ago (contrary to their San Diego neighbor, Ballast Point, which has apparently decided to withdraw distribution in NJ due to unmet demand). Oh, and stop pouring IPAs into a pilsner glass. Such heresy must not stand! Yes no more pilsner glasses …. IPA must be consumed through a green crazy straw straight from the bottle!! I have a few Buzz Lightyear sippy cups laying around. Consider it done.